Still, almost all wealthy investors credit their education as a factor in their wealth status, and most consider the education of their children and grandchildren as vital to the financial well-being of their offspring. Spectrem’s wealth segmentation series regularly asks investors from different wealth segments about their college education, finding that most wealthy people have college degrees, and many have post-undergraduate degrees. For instance, among Ultra High Net Worth investors with a net worth between $5 million and $25 million, 92 percent graduated college, and 68 percent (more than two-thirds) go on to gain graduate degrees. Among Millionaire investors with a net worth between $1 million and $5 million, 82 percent graduated college and 42 percent went on to get graduate degrees. While this research indicates there are affluent investors who managed to achieve financial success without a college degree, most investors do have parchment in their portfolio. The value of this research to advisors is in determining just what investors believe in regards to the education of their progeny. Many investments are made with an eye toward preparing the next generation financially, and advisors need to know if the investors they work with believe their children need a college education, or would benefit more from other types of life experience. The research shows that most affluent investors place great value on their college education. In Spectrem’s recent research study Financial Behaviors and the Investors Mindset, UHNW investors were asked to place a value on the statement “getting a college education is very important” on a 0-to-100 scale. The rating averaged out to 88.24, which was higher than the value rating they gave to home ownership, having a dedicated savings plan or even having a lifetime occupation. (Among Millionaires, the rating for the value of college education was 85.65, still high but slightly lower than the UHNW. For Mass Affluent investors, with a net worth between $100,000 and $1 million not including primary residence, the value was 83.12). 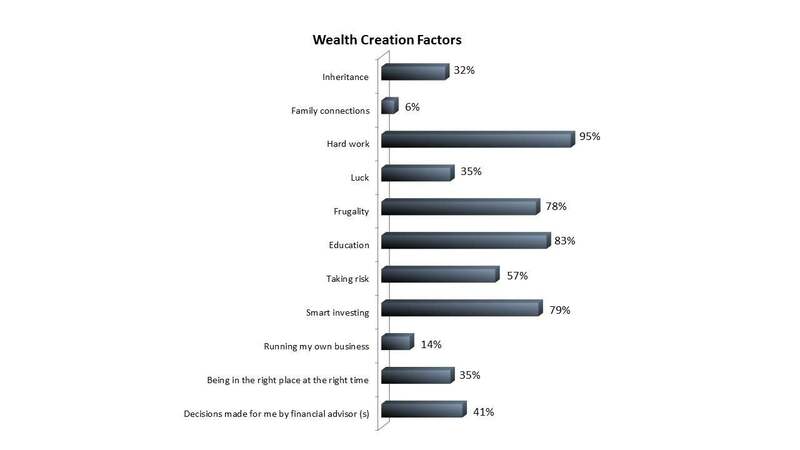 Most affluent investors claim their education is one of the key factors to their wealth. Among the UHNW investors, 93 percent said education was a wealth creation factor, and only “hard work” topped education on the list at 97 percent. That opinion is not universally shared to the same degree by younger investors. Among Millennials and Gen X investors in the UHNW wealth segment, 86 percent credited education for their wealth, still a significant percentage but not quite as high as older investors. Among the many questions advisors need to ask investors is their attitude toward post-secondary school education, not only in their own lives but in the lives of their children. This will produce a direction for the first step in providing the necessary funds to pay for a college education if that is the direction chosen by the offspring. Investors who doubt the value of the higher education need only look at the correlation between financial success and related degrees. While money doesn’t ensure happiness, it often mitigates stress.